Manager Boxu Potts, from left, trainer Lennox Blackmore, Sheldon Lawrence, coach Alric Johnson and referee Ian Jardine at a previous bout. 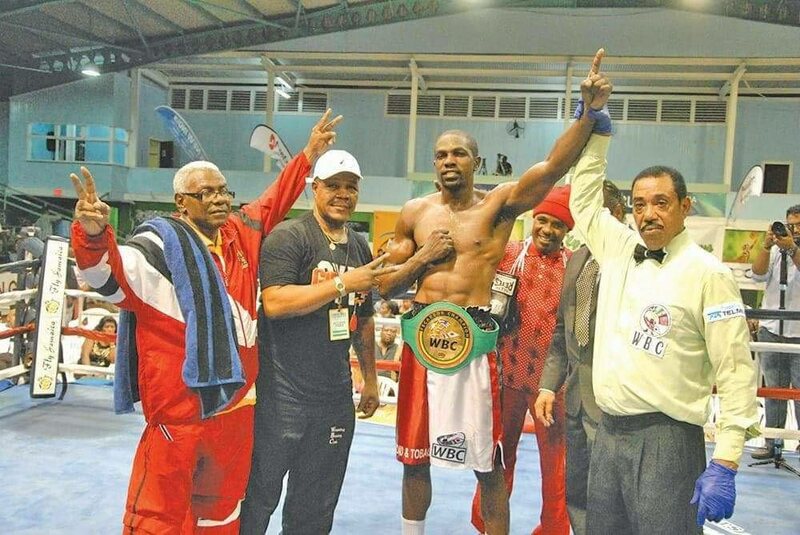 WORLD Boxing Council light heavyweight champion Sheldon Lawrence of TT is counting on getting elite funding in a timely manner to properly prepare for a fight in Georgetown, Guyana, in August. Lawrence is now ranked 18th in the world, but he has not fought since defending his title against Sean Corbin in Guyana in January. According to Boxu Potts, Lawrence’s manager, the Fecarbox champion is very frustrated. Potts said he has advised his boxer to incorporate his training into his daily routine by stopping his taxi about 5km before he reaches home after work and running the remainder. Lawrence and Potts are calling on new Minister of Sport Shamfa Cudjoe to look into this matter. Lawrence was scheduled to fight an opponent in Venezuela on July 28, however he will have to turn down the opportunity as he has not been able to train enough due to work commitments. Potts wants Lawrence to go to Guyana next month. “Should he be given his elite funding in a timely manner, we are hoping to get Lawrence back in the gym and training to prepare him to defend his title against Quincy Jones, in Georgetown, Guyana in August,” Potts said. Reply to "Lawrence needs funding to fight in Guyana"